This article is about the block from Thaumcraft 4. You may be looking for Arcane Door from Thaumcraft 3. 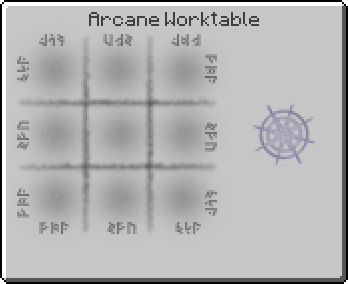 Arcane Door is an item added by the Thaumcraft 4 mod. This door can only be broken by the player who has placed it. Functions the same as Wooden Door for the owner, and totally indestructible for any other players (except the ones given Iron Arcane Key or Gold Arcane Key to this door). Cannot be opened by redstone signal, but can be opened by Arcane Pressure Plates if such plates are placed directly next to the door. Is not affected by gravity, can even float in mid-air if the block under it is broken. "Some experimentation has led to an interesting discovery - the ability to imprint memories in inanimate objects. Your first attempt at using the discovery is doors, pressure plates and other blocks that remember who placed them. The door can only be removed with a wand by the person who placed it. Additionally the door will refuse to open for anyone but its owner. The owner can also craft iron or gold keys that will grant others access to this door. By crafting an iron key and clicking on the door, you will link the key to that door. You can then give the key to another person and they will be able to use it on the door to gain permanent permission to open it. They will still not be able to break the door, or grant anyone else access. For that you need the gold key. The gold key serves much the same function as the iron key, except they can also grant other people iron key access to that door. Only the original owner of the door can hand out gold key access. They are also not able to remove the door with a wand. Only the original owner will be able to do that. This pressure plate has a few novel features. Firstly it has 3 settings that can be toggled by right-clicking on it: It can trigger on everything (like a wooden pressure plate), just you, or everything except you. Secondly, like all other warded items only you can remove it. Lastly it can be linked to other players with the use of keys. These pressure plates can be used to open arcane doors as long as someone with access to the plate has access to the door as well. Warded glass is a simple cosmetic block, but like other warded objects it cannot be broken except by the person who placed it. Keys cannot be used to give other users access." Arcane Door (Thaumcraft 4) has no known uses in crafting. This page was last modified on 5 March 2018, at 17:07.